Myoadenylate deaminase is a skeletal muscle specific isoenzyme of AMP deaminase (AMPD; EC 3.5.4.6) that plays an important role in regulating adenylate energy charge and nucleotide metabolism. An inherited defect of this enzyme has been reported to be due to a single mutant allele with two linked mutations of C34T (exon 2, Q12X) and C143T (exon 3, P48L) of the AMPD1 gene in almost all cases.1,2 Further, a previous report showed a very high frequency (10−14%) of the C34T allele in whites and African Americans,2 although it has not been found in a Japanese population. Although most individuals with homozygous C34T alleles are assumed to be asymptomatic, some have been reported to show a relatively mild clinical phenotype including exercise induced myalgia.1 Recently, additional findings for missense mutations were reported in Japanese (R388W and R425H)3 and in whites (G468T)4 who showed muscle weakness and myalgia. Therefore, the relationship between abnormal purine nucleotide catabolism and skeletal muscle dysfunction4 is intriguing. In addition, other studies have reported that the C34T allele correlates with improved clinical outcome in patients with heart disease.5,6 We speculated that reduced AMPD activity in skeletal muscle would increase the production of the cardioprotection molecule, adenosine, resulting in increased levels of adenosine in the circulating system, although the fundamental mechanisms responsible for the disorder due to AMPD mutations are unclear. In the present study, we attempted to determine other AMPD1 mutations and their distribution in ethnically diverse population groups, in order to better understand AMPD1 deficiency and its functional relevance. We identified 35 variations in and around the AMPD1 locus, including newly identified missense mutations. By estimating SNP haplotypes and defining typical haplotypes of the AMPD1 locus, we were also able to describe a phylogenic tree for ancestral AMPD1 haplotypes responsible for the most common variant, C34T. Furthermore, we identified two new mutant alleles, A860T (K287I) and G930T (M310I), in German myopathic patients and revealed their enzymatic defect. DNA samples from German (n = 100), Japanese (n = 50), European American (n = 48), and African American (n = 32) subjects were prepared using a standard protocol after informed consent was obtained. DNA samples from Americans were obtained from the Duke University Medical Center, Center for Human Genetics, while the German samples included those from myopathic patients diagnosed and examined at Medizinische Poliklinik, Universitat Munchen. In addition to the human samples, DNA samples from chimpanzees (Pan troglodytes) were also used. Myoadenylate deaminase (AMPD) deficiency is one of the most common metabolic disorders seen in white populations. For nearly all individuals with this inherited deficiency, a single mutant allele of two linked mutations, C34T and C143T in AMPD1, is causative, with an allele frequency of 10−14% in the general population. We were interested in whether natural selection might be involved in higher allele frequency, as epidemiological reports have found the C34T allele to be associated with improved clinical outcome in heart disease. We analysed single nucleotide polymorphisms (SNPs) in the AMPD1 locus in 230 individuals, who comprised 80 German myopathic patients and 150 volunteers from African American (n = 32), European American (n = 48), German (n = 20), and Japanese (n = 50) ethnic groups. To better understand the causative allele of AMPD deficiency, we defined 10 SNP haplotypes based on the 6 SNPs that are commonly shared among different population groups with a high allele frequency. From our results, we were able to define a phylogenic tree of ancestral haplotypes responsible for the causative allele of AMPD deficiency. We did not find a heterozygote advantage for AMPD deficiency. 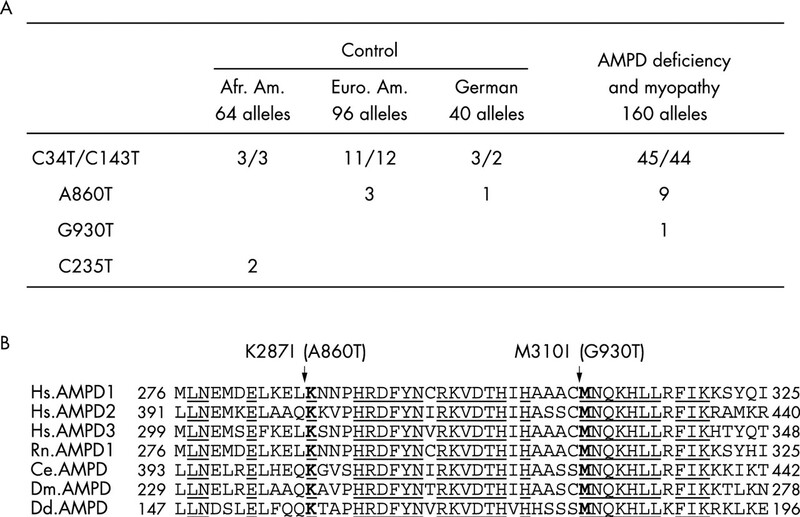 We identified two new missense mutations for AMPD1, A860T (K287I), and G930T (M310I), in the German myopathic patients. A prokaryotic expression study revealed a functional defect for both of these mutants. Primer sets were designed for PCR amplification of each fragment ranging from 200 to 400 bp in length, based on the public genome database (GenBank accession nos AL096773 and NT019273) to amplify all 16 exons, including the adjacent partial introns and proximal regions of AMPD1, as shown in table 1. SNPs were genotyped by the following PCR based methods: multiple fluorescence based PCR single strand conformational polymorphism analysis (MF PCR-SSCP),7 denaturing high performance liquid chromatography analysis (DHPLC)8, and direct sequencing analysis. PCR amplification was carried out in a volume of 20 µl, containing 5 ng of genomic DNA, standard PCR buffer (10 mmol/l Tris/HCl, pH 8.3, 50 mmol/l KCl, 1.5 mmol/l MgCl2, 0.001% gelatin), dNTPs (0.2 mmol/l each), primers (0.2 µmol/l each), and 0.5 U of AmpliTaq Gold (PE Biosystems, Foster City, CA, USA) under the following conditions: initial denaturation at 95°C for 10 minutes, followed by 37 thermocycles for denaturation at 95°C for 30 seconds, annealing at 56°C for 1 minute, and extension at 72°C for 1 minute, with a final extension step at 72°C for 10 minutes. MF-PCR-SSCP analysis was performed using an ABI Prism 377 DNA Sequencer (PE Biosystems) at 20°C. PCR products for MF-PCR-SSCP analysis were prepared using fluorescence labelled primers (FAM, HEX, NED, and ROX; PE Biosystems), which were mixed with formamide dye and heat denatured, followed by electrophoresis on a 5% polyacrylamide gel, with or without 10% glycerol in TBE buffer. Data collection and mobility shift analyses were carried out using the GeneScan program (PE Biosystems). DHPLC analysis was performed using a Wave DNA fragment analysis system (Transgenomic, Omaha, NE, USA). PCR products for DHPLC analysis were denatured according to the manufacturer’s protocol. Optimal DNA melting temperatures were calculated with the WaveMaker program (version 3.3; Transgenomic) and sequence variations were screened. Direct sequencing analysis was performed to confirm SNP candidates using a PCR product Pre-Sequencing kit (USB, Cleveland, OH, USA) and Big Dye Terminator Sequencing kit (PE Biosystems) with a DNA sequencer (377, 3700, or 3100 DNA Analyzer; PE Biosystems). Haplotype estimation and linkage disequilibrium (LD) analysis were carried out using the computer program, LD Support,9 which is a maximum likelihood method based on an expectation maximisation algorithm. The allele frequency for each SNP was calculated by directly counting respective alleles. Hardy-Weinberg equilibrium was tested by the χ2 approximation method. To confirm the validity of the estimated haplotype, direct checking of SNP haplotypes was performed by a method that employed long range PCR amplification. LA Taq polymerase (Takara Shuzou, Ohtsu, Japan) with allele specific oligonucleotide primers that differed at the end of the 3′ base (table 2), was used for PCR amplification of 3–17 kb fragments of the haploid allele, followed by confirmation of the other SNP sites by direct sequencing. We searched the sequence variations in the AMPD1 locus for approximately 9 kb, including the entire coding exons (2244 bp), parts of introns adjacent to splice site consensus sequences, and the promoter region. In the Japanese, European American, and African American population groups, we identified 24 SNPs, 6 polymorphisms for insertion or deletion (Ins/Del), and 3 short tandem repeat polymorphisms (table 3). We also found relatively higher allele frequencies (average 22.3%) for SNPs shared among two or three of the population groups, whereas lower allele frequencies (average 2.3%) were observed in population specific SNPs. Among the SNPs detected in the coding region, five of eight were found to cause amino acid substitution. SNP diversity was calculated as 5.3×10−4 in African Americans, 4.8×10−4 in European Americans, and 3.6×10−4 in Japanese. In the German patients with myopathy, we identified two novel non-synonymous variations, A860T (K287I) in exon 7 and G930T (M310I) in exon 8, in addition to the known variants with C34T and C143T. Both K287I and M310I were located at the positions where the amino acid residues were completely conserved among a wide range of species including humans, Rattus norvegicus, Arabidopsis thalliana, Caenorhabditis elegans, and Dictyostelium discoideum, as shown in fig 1. In addition to the myopathic patients, the A860T variation was found in non-myopathic European Americans and in Germans at an allele frequency of 3.1% and 2.5%, respectively, while that in the myopathic patients was found to be 6.5%. In the African American population, another non-synonymous variation, C235T (R79W), was found in two individuals. There was no evidence for heterozygote advantage of AMPD1 variation, as Hardy-Weinberg equilibrium was maintained in any of variations. Non-synonymous variations found in AMPD1 and sequence conservation between species. (A) Three non-synonymous sequence variations (A860T, G930T, and C235T) were newly identified in addition to the common variations, C34T and C143T, when German mypathic patients with AMPD deficiency and myopathy, as well as control subjects from African American (Afr.Am. ), European American (Eur.Am. ), and German backgrounds were examined. (B) K287I(A860T) and M310I(G930T) substitutions were located at the position where the amino acid residues are completely conserved in AMPDs of many species. Hs, human; Rn, rat; Ce, C. elegans; Dm, Drosophila melanogaster, Dd, Dictyostelium discoidem. Based on the obtained information regarding sequence variations in AMPD1, we next attempted to determine the SNP haplotypes in this locus. In order to minimise the number of haplotypes within this region, we selected 6 SNPs from the 24 described above, which are commonly found among population groups and comprised one from the 5′ upstream region, one for intron 2, two for intron 4, and two for intron 6, as shown in fig 2. Using information for these SNPs, we analysed linkage disequilibrium (LD) among the representative SNPs in each population group (fig 2). The Japanese population was found to have a greater D’ value than the other groups, which is likely to be due to the low genetic variation within the Japanese population. The African American and European American populations were found to have a rather small value for D’, indicating that a recombination event occurred more frequently. Therefore, it was thought necessary to confirm the haplotypes directly in some individuals to avoid underestimation of the frequency. Following genotyping, we determined haplotype frequencies in the population groups and estimated the diplotype configuration for each individual using the LD Support program. With these procedures, we found 10 major haplotypes for the AMPD1 locus (fig 3). 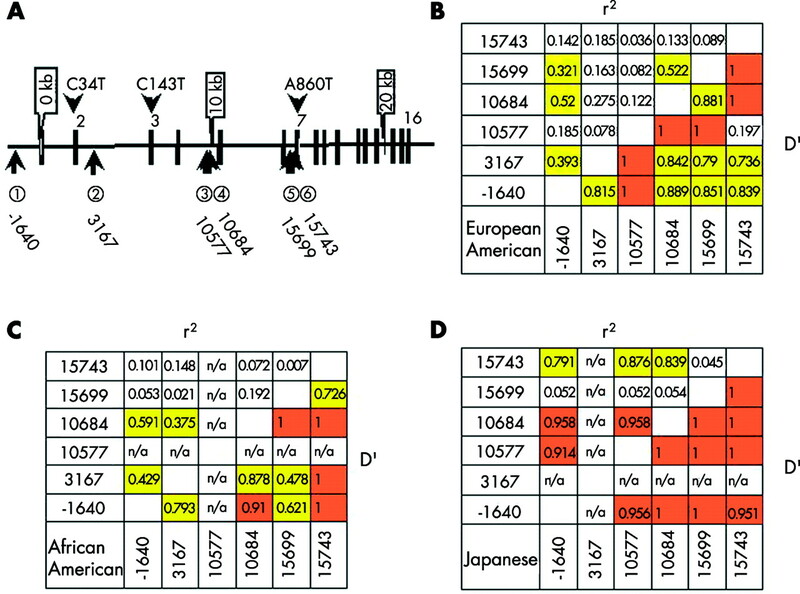 Common SNPs and linkage disequilibrium in the AMPD1 locus. Six common SNPs at positions −1640, 3167, 10577, 10684, 15699, and 15743 among populations were depicted (A). Linkage disequilibrium between two SNPs was evaluated by calculation of r2 (measure of disequilibrium) and D’ (standardised disequilibrium coefficient measurement) values using the LD Support program9 in European American (B), African American (C), and Japanese (D). SNP haplotypes in the AMPD1 locus. (A) Ten major haplotypes for six common SNPs (−1640, 3167, 10577, 10684, 15699, and15743) estimated by the LD Support program9 and their frequencies were shown in different populations. A chimpanzee haplotype for those SNPs was also shown as a reference. (B) Haplotypes (Ht 1+, Ht 10+, Ht 11+) for common missense SNPs (C34T, C132T, A860T) estimated by LD Support and relation to major haplotypes shown in fig 3A. Their frequencies in each population or patient group are also depicted. In addition to the population groups, we determined genotypes for this locus in chimpanzee DNA in order to approximate the most ancestral SNP haplotype. We determined genotypes from five chimpanzees by direct sequencing and found that all six of the polymorphic sites mentioned above were monomorphic. Based on the genotype found in chimpanzee DNA, we determined that the corresponding haplotype, Ht1, was the most ancestral haplotype for AMPD1. Using an order of single step substitution method to create newer SNP haplotypes, we successfully determined the phylogenetic tree of SNP haplotypes, which is shown in fig 3, although we also had to consider the recombination event for some steps. Using these procedures, we found that the C34T (Q12X) allele belongs to two distinct SNP haplotypes, of which the major type is Ht10. 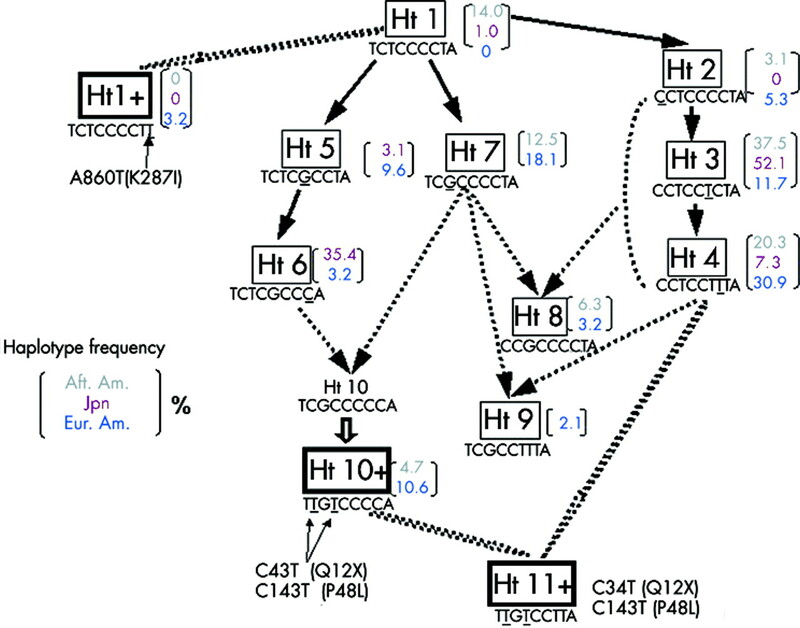 We also postulated that the other haplotype, Ht11+, found in the German population, was derived from Ht10 and Ht4 by recombination between introns 4 and 6. Using recombinant proteins, we evaluated the functional significance of the two missense mutations of AMPD1, newly identified in myopathic patients. We constructed the following expression vectors: pGEX-rAMPD1 for the rat wild type AMPD1, pGEX-K287I for the K287I mutant of rat AMPD1, pGEX-M310I for the M310I rat mutant AMPD1, and pGEX-myc as a negative control, all of which were made to produce fusion protein with glutathione S-transferase peptide in addition to the c-myc epitope at the N terminus of the AMPD1 peptide. All of the constructs were found to produce recombinant proteins at a similar level, which was confirmed by Western blot analysis with anti-AMPD1 and anti-c-myc (9E10) antibodies. The mutant recombinant proteins showed only half or one third of the catalytic activity of the wild recombinant protein under the conditions studied, as shown in table 4. In addition, altered kinetic properties in these mutant recombinant proteins were found based on the measurement of apparent Km values for the substrate AMP (7.3 (1.3) mmol/l (K287I) and 7.6 (1.0) mmol/l (M310I) compared to that of the wild type (3.8 (0.4) mmol/l)). We found new genetic polymorphisms in the AMPD1 locus, including 24 SNPs, 6 insertions/deletions, and 3 short tandem repeat polymorphisms among 3 ethnically different population groups; however, we did not find the sequence variation for G468T that was recently reported in myopathic patients,4 even though we included individuals from several ethnic groups as well as 80 myopathic patients. As we did not find clear deviation from Hardy-Weinberg equilibrium in any of variations, there was no evidence for heterozygote advantage for the AMPD1 mutation. Therefore, genetic drift rather than natural selection of a variant is the likely reason for high frequency of the C34T variation. We also attempted to deduce individual haplotypes based on the genotype dataset for each population group using LD Support. In order to utilise the haplotype information for comparing individuals among different populations, we selected six common SNPs (fig 2) that had a high allele frequency in each population group for further study, as such classification was thought to be useful to assess the ancestral haplotype causing AMPD1 deficiency, as reported previously. Such selection of SNPs resulted in a reduced number of inferred haplotypes of the AMPD1 locus. To confirm the individual haplotype set (diplotype), we also determined SNP diplotypes in some individuals by direct PCR amplification using allele specific primers and by sequencing the respective haploid alleles, although the results did not change the estimated result determined by the LDSupport program in most cases. 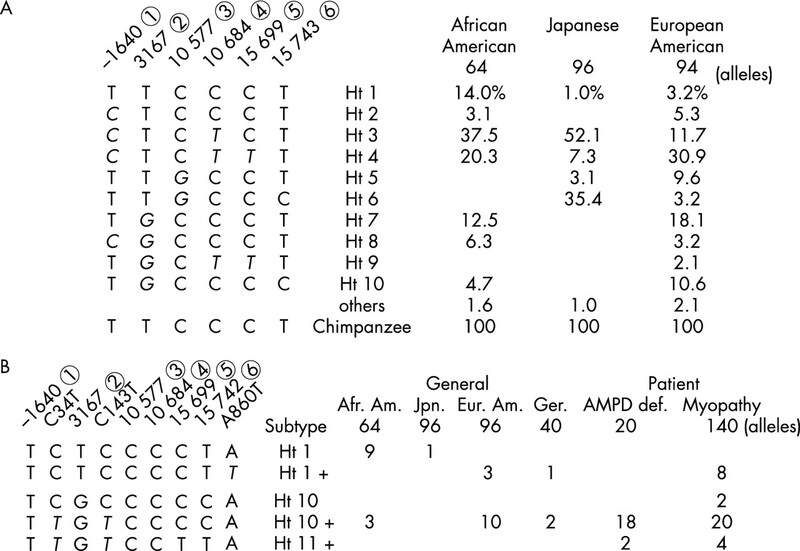 In all three population groups, the most ancestral human haplotype of the AMPD1 locus, Ht1, was found, although all individuals of European descent with the Ht1 haplotype also contained the A860T (K278I) substitution (Ht1+), whereas no African American or Japanese individuals had the Ht1+ variant. Therefore, we speculated that individuals with Ht1+ were probably widespread among white populations created when their ancestors had migrated from Africa to Europe. We also classified haplotypes with the C34T substitution as Ht10 derivatives, which were Ht10+ and the recombined haplotype, Ht11. These haplotypes were also thought to have originated relatively recently, probably after the European ancestor had left Africa, as Ht10 is considered to be created by a recombining event between Ht6 and Ht7, and was not found in the African American or Japanese populations. Therefore, the mutation event for the most common AMPD1 deficiency (C34T) was also thought to have occurred after the European ancestor had migrated from Africa. Regarding the relationship between the two haplotypes, Ht10+ and Ht11+, for AMPD1 deficiency (C34T), we speculated that Ht10+ was fixed earlier than Ht11+ in some populations, because Ht11+ is considered to require an additional recombining event with Ht10+, and Ht11+ was found only in the German myopathy patents. However, there was no further information regarding when and where the C34T mutation was added to individuals with Ht10, although the GenBank database (AL096773, NT019273) was found to contain the sequence information for this rare haplotype. As for haplotype phylogeny, we successfully constructed a haplotype network for Ht1 through Ht7 by assuming single step substitution events, while we also took into account recombining events, as shown in fig 4. This situation was similar to previous reports and is thought to reflect human migration or evolutionary history.12 In addition to haplotypes carrying the C34T mutation, we found another carrying the K287I mutation, Ht1+, in both German and European Americans, but not in the African American populations. The distribution and frequency of Ht1+ was quite similar to Ht10+ carrying C34T. However, the German patients with myopathy did not exhibit any significantly different characteristics regarding the frequency of this haplotype compared with the European Americans. In contrast, the haplotype Ht8 was found to have different frequencies among the different groups, as it occurred more frequently in the German patients and control individuals compared with the European American control individuals (data not shown). Phylogenic tree of SNP haplotypes in the AMPD1 locus. Ten major haplotypes and three derivative haplotypes (Ht 1+, Ht 10+, Ht 11+) are shown. Frequency of each haplotype in population (Afr. Am., African American; Jpn., Japanese; Eur. Am., European American) is also depicted. In our investigation, we could not find any causative haplotype allele of the AMPD1 locus specific to the 39 myopathic patients without the AMPD1 mutation, although it is possible that these patients may harbour another causative genetic abnormality. In fact, we found four mutations in AMPD1 in the remaining 41 myopathic patients. Haplotypes carrying the C34T and C143T variants were the most frequent in the patients, as reported previously. Further, these two variant sites were found to have a high degree of linkage disequilibrium with each other and were detected in 35 of the patients with myopathy. In addition to these SNPs, one of the other two mutations, A860T or G930T, was found in nine of the myopathic patients, and it was interesting that one patient was found to be homozygous for the A860T mutation and three were heterozygous for A860T as well as for C34T and C143T. Thus, these four patients could be considered to be homozygotes or compound heterozygotes for the defective AMPD1 allele. It was also notable that the allele frequency of A860T was found to be from 2% to 3% in the German and European American control individuals. For mutation A860T (K287I), we found a high level of conservation among many species, including Saccharomyces cerevesiae, Arabidopsis thaliana, and humans. Thus, it was intriguing to determine whether this mutation could cause a functional relevance of AMPD1 and provide an explanation for myopathy if all of these variants were not the sole cause of the defective function of AMPD1. To detect the causative variation for AMPD deficiency, we attempted to study the enzymatic activity and characteristics of the A860T mutation. A low level of catalytic activity in conjunction with a lower affinity to the substrate AMP could cause defective AMPD function. As we could not perform further investigations on individuals with an A860T or G930T mutation, future study will be needed to confirm the functional defect in these mutations. However, the functional defect of these mutants would be supported not only by lower activity at higher substrate levels but also by lower affinity to the substrate. In summary, we successfully surveyed SNP variations in the AMPD1 locus and identified ancestral haplotypes for the most common type of AMPD deficiency, C34T, although we could not precisely determine the functional relevance of this very common genetic defect. We also found another common variant, A860T, which is responsible for the defective AMPD function. Further detailed study will be needed to confirm the relationship between these AMPD variants and cellular functions. This work was supported in part by research grants from the Ministry of Education, Culture, Sports, Science and Technology, the Ministry of Health, Labour and Welfare, and the Gout Research Foundation of Japan. We thank Dr Y Sakaki (Human Genome Center, Institute of Medical Science, The University of Tokyo), Dr A Fujiyama (National Institute of Genetics/RIKEN Genomic Science Center), Dr Y Kuroki (RIKEN Genomic Science Center), and Dr T Ishida (Graduate School of Science, The University of Tokyo) for providing the chimpanzee DNA samples. We also thank Ms M Shimokawa for her technical assistance. Sabina RL, Holmes EW. Myoadenylate deaminase deficiency. In: Scriver CR, Beauder AL, Sly WS, Vall D, eds. The metabolic and molecular basis of inherited disease. New York: McGraw-Hill, 2001:2627–38. Morisaki T, Gross M, Morisaki H, Pongratz D, Zollner N, Holmes EW. Molecular basis of AMP deaminase deficiency in skeletal muscle. Proc Natl Acad Sci USA1992;89:6457–61. Morisaki H, Higuchi I, Abe M, Osame M, Morisaki T. First missense mutations (R388W and R425H) of AMPD1 accompanied with myopathy found in a Japanese patient. Hum Mut2000;16:467–72. Gross M, Rötzer E, Kölle P, Mortier W, Reichmann H, Goebel HH, Pngratz D, Mahnke-Zizelman DK, Sabina RL. A G468-T AMPD1 mutant allele contributes to the high incidence of myoadenylate deaminase deficiency in the Caucasian population. Neuromuscl Disorder2002;12:558–65. Loh E, Rebbeck TR, Mahoney PD, DeNofrio D, Swain JL, Holmes EW. Common variant in AMPD1 gene predicts improved clinical outcome in patients with heart failure. Circulation1999;99:1422–25. Anderson JL, Habashi J, Carlquist JF, Muhlestein JB, Horne BD, Bair TL, Peason RR, Hart N. A common variant of the AMPD1 gene predicts improved cardiovascular survival in patients with coronary artery disease. J Am Coll Cardiol2000;36:1248–58. Iwahana H, Yoshimoto K, Mizusawa N, Kudo E, Itakura M. Multiple fluorescence-based PCR-SSCP analysis. Bio Tech1994;16:296–305. Underhill PA, Jin L, Lin AA, Mehdi SQ, Jenkins T, Vollrath D, Davis RW, Cavalli-Sforza LL, Oefner PJ. Detection of numerous Y chromosome biallelic polymorphisms by denaturing high-performance liquid chromatography. Genome Res1997;7:996–1005. Kitamura Y, Moriguchi M, Kaneko H, Morisaki H, Morisaki T, Toyama K, Kamatani N. Determination of probability distribution of diplotype configuration (diplotype distribution) for each subject from genotypic data using the EM algorithm. Ann Hum Genet2002;66:183–93. Marquetant R, Desai NM, Sabina RL, Holmes EW. Evidence for sequential expression of multiple AMP deaminase isoforms during skeletal muscle development. Proc Natl Acad Sci USA1987;84:2345–9. Evans GI, Lewis GK, Ramsa G, Bishop JM. Isolation of monoclonal antibodies specific for human c-myc proto-oncogene product. Mol Cell Biol1985;5:3610–16. Cavalli-Sforza LL Feldman MW. The application of molecular genetic approaches to the study of human evolution. Nat Genet2003;33(Suppl):266–75.